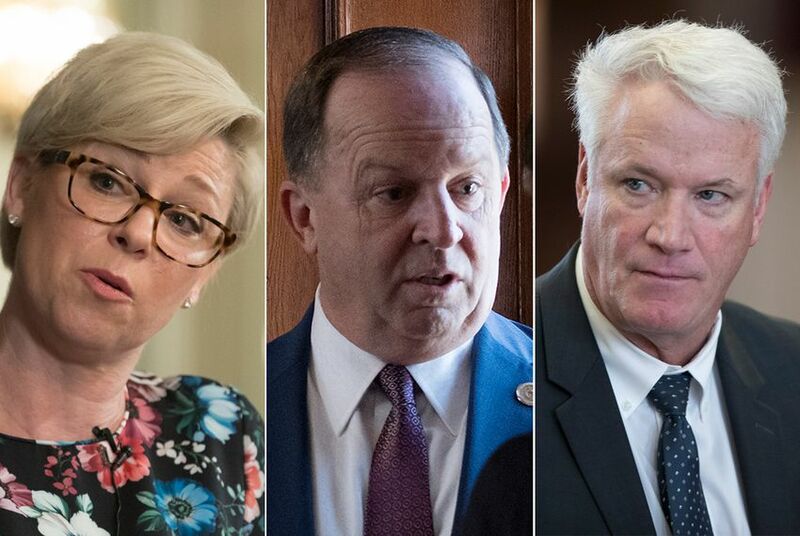 Of the three Republican incumbents targeted by Gov. Greg Abbott in this year's primaries, two won victories Tuesday night. Several other open-seat races are headed to runoffs May 22. After Gov. Greg Abbott spent more than a quarter of a million dollars in a campaign to unseat three Republican incumbents in the Texas House, two of those incumbents nonetheless defeated their primary challengers Tuesday. And state Rep. Sarah Davis, Abbott’s most explicit target, bested challenger Susanna Dokupil by more than 12 percentage points. In a victory celebration, she thanked voters for re-electing her, telling them this primary race had significance far beyond her Harris County district. “It was about whether the Republican party would be big enough to support diverse voices, and the right of a representative to vote her conscience and her district,” she said, framed by celebratory balloons. Davis took several explicit shots at Abbott — who has called out her voting record in ways she has called disingenuous — as well as her opponent, who is backed by the anti-vaccine movement. Davis thanked her district for “supporting science and medicine — and vaccines,” to big applause. "No amount of money in a campaign account can buy back your reputation when you squander it by making false accusations to exploit the suffering brought to us by the natural disaster that was Hurricane Harvey,” Davis said, in an apparent reference to Abbott’s claim that a Davis bill filed in 2017 might have undercut the state’s response to Harvey. Abbott also failed to unseat state Rep. Lyle Larson, a San Antonio Republican who was holding off a challenge from Hollywood Park Mayor Chris Fails. Larson, a four-term House incumbent who has clashed with Abbott over ethics issues, won with 60 percent to Fails’ 40 percent. Larson said Abbott “didn’t do himself any good in Bexar County by coming after me.” The governor had attacked the incumbent as “Liberal Lyle” in a television attack last month. But Abbott’s third challenger, Mayes Middleton, defeated incumbent Wayne Faircloth, R-Galveston. Middleton, an oil and gas businessman backed by Abbott, won with 57 percent of the vote to Faircloth's 43 percent. Abbott congratulated Middleton in a video Tuesday night. “I look forward to welcoming you, officially, to the Texas Legislature next session,” the governor said with a smile. Meanwhile, two vulnerable Republicans looked likely to survive tight challenges from the right in races that Abbott sat out. State Rep. Charlie Geren, R-Fort Worth, fended off a repeat challenge from Bo French in perhaps the House’s ugliest primary race. In a repeat of a bitter 2016 primary, French challenged Geren from the right, hoping to unseat the nearly two-decade incumbent. French had the backing of conservative groups, including Empower Texans. Weeks before Tuesday’s primary, Empower Texans sent out a mailer from the invented “Texas Ethics Disclosure Board” warning constituents that Geren is married to a lobbyist. French has also alleged that a political operative working for Geren asked Child Protective Services to investigate French’s family. And Dan Flynn, R-Canton, beat challenger Bryan Slaton with a small margin — 52 percent to 48 percent. That race is a rematch of the 2016 primary when Slaton, a conservative challenger, lost by only about 600 votes of 30,000 cast. Flynn, who’s been in the House since 2003, hired a political consultant in the race for the first time. But a third — Dallas Republican Jason Villalba — fell to challenger Lisa Luby Ryan, an interior designer who came at him on the right with the backing of Empower Texans. Villalba, one of the most moderate Republicans left in the House, was one of the only members of his party who spoke out vocally against the “bathroom bill” raised last session that would have regulated the use of certain public facilities for transgender Texans. Luby Ryan raised more money than Villalba and picked up several key conservative endorsements. The members of the Texas House Freedom Caucus who faced challengers in Tuesday’s primary looked safe. The two incumbents facing the closest races — state Reps. Mike Lang and Kyle Biedermann — both pulled out comfortable victories with about 58 percent of the vote. And like the governor, the powerful conservative group Empower Texans saw many of the new candidates it had backed fail Tuesday night. Of the 16 Republican challengers who won an endorsement from the group, only Luby Ryan and Middleton won their challenges against an incumbent. In open races, however, the group had more luck. Steve Toth, running for the seat being vacated by incumbent state Rep. Mark Keough, R-The Woodlands, won a decisive victory. Jonathan Boos won in House District 113, where Sunnyvale Republican Cindy Burkett is departing. And the hardline conservative group may see more success after May 22, when several open-seat races will hold runoff elections. One of those runoffs will come in House District 13, where five Republicans are competing to replace Caldwell state Rep. Leighton Schubert. That runoff will pit Jill Wolfskill, a Bellville businesswoman, against former judge Ben Leman. Both will also compete May 5 in the special election to fill the remainder of Schubert’s term. Wolfskill has the backing of Empower Texans and the Texas Right to Life PAC, and even the campaign staffing of Emily Horne, a longtime Right to Life staffer. Deanna Metzger, who's backed by Empower Texans, will go on to compete in the runoff in House District 107, currently held by Democrat Victoria Neave of Dallas. Stuart Spitzer, a former state representative running to take back his seat, led the four candidates in his race, and will compete against electrical contractor Keith Bell in the runoff this May. Spitzer said he would “absolutely” consider joining the conservative Freedom Caucus if voters send him back to the House in 2019. Thomas McNutt, who won the endorsement of Abbott and Empower Texans, will also head to a runoff in May, fighting the more moderate Cody Harris. McNutt ran for the seat in 2016 and lost to departing incumbent state Rep. Byron Cook. There will also be runoff elections in several other Republican House races, including at least one involving a Republican incumbent. State Rep. Scott Cosper will face Brad Buckley in a runoff in May. Correction: A photo caption in this story originally misidentified the order of the candidates pictured.